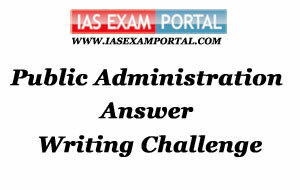 Weekly Mains Exam 2016 Answer Writing Challenge - Public Administration "MODULE- 37" | IAS EXAM PORTAL - India's Largest Community for UPSC Exam Aspirants. Weekly Mains Exam 2016 Answer Writing Challenge - Public Administration "MODULE- 37"
Public Administration- Paper I "Syllabus Topic –Development Dynamics"
Q1. Empowerment of women and development of children are intrinsically interlinked. Discuss. 20 Marks. Indian Administration- Paper II "Syllabus Topic – Rural Development"
Q2. Proper governance and Public expenditure on the right lines combined with empowerment have an impact on Poverty especially in rural areas. Examine. 20 Marks.